Simona Mangiante Papadopoulos, wife of former Trump campaign foreign policy adviser George Papadopoulos, told CBS News that she plans to testify before the House Intelligence Committee on July 18. A 33-year-old lawyer – who cites modeling and acting as hobbies and is said to be a native of Caserta, Italy – Mangiante Papadopoulos indicated she would pay her own way to travel to Washington, D.C. from Chicago, where she and her husband reside, to overcome a snag over the reimbursement of her travel expenses. Plans for her testimony were momentarily derailed when, she said, she was told by the committee's minority that Republicans would not cover the costs of witness transportation. Democrats on the committee have vowed to continue interviewing witnesses as part of their own investigation into Russia's interference in the 2016 election, though Republicans unilaterally announced a conclusion to the probe months ago. The majority's final report said the investigation yielded no evidence of collusion between the Russia and the Trump campaign. Mangiante Papadopoulos will be the second known witness to appear before the committee since the investigation was concluded; Democrats interviewed Cambridge Analytica whistleblower Chris Wylie in April. It is unclear whether Republicans will participate in this interview; spokesmen for the committee's majority and minority both declined to comment. George Papadopoulos, whom Mangiante Papadopoulos married in March, has been a central figure in the numerous investigations into connections between the Trump campaign and Russia. The former aide's disclosure to an Australian diplomat that the Russians had damaging information on Hillary Clinton in May 2016 reportedly triggered the opening of the FBI's original inquiry in July. Papadopoulos pleaded guilty to making false statements to the FBI last October about contacts he had with a professor linked to the Kremlin, and is presumed to be cooperating with special counsel Robert Mueller's ongoing investigation. His sentencing is scheduled for September 7. Mangiante Papadopoulos has become increasingly outspoken about her belief that her husband was "targeted" by both informants and investigators because of his connection to the Trump campaign. She describes him as a "victim" and, in a number of media interviews, has made personal appeals to President Trump to issue a pardon. In tweets, she has suggested the FBI's investigation was a setup. 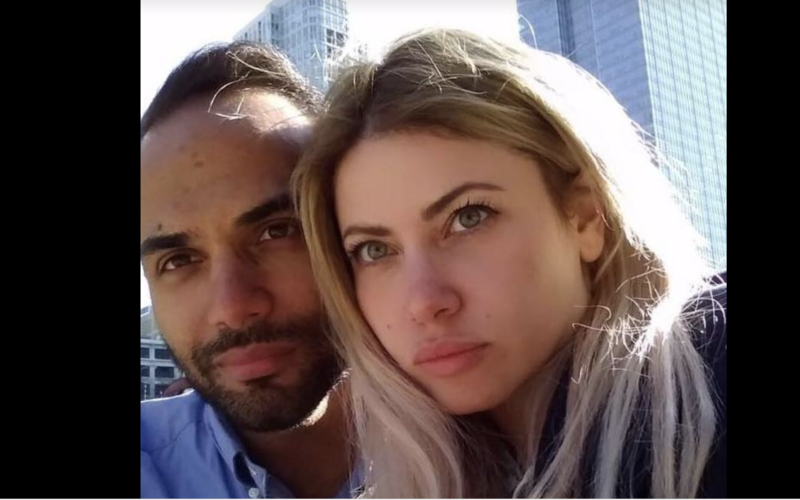 She has also set up a GoFundMe page requesting funds for the couple's legal fees, saying Papadopoulos' role has been "profoundly misunderstood and abused." The account has garnered 13 contributions to date. For its part, the White House has sought to distance itself from Papadopoulos, claiming he worked only as a volunteer and that his role overall was "extremely limited" – though he was known to have made efforts to arrange high-level meetings, including one, which never materialized during the campaign, between Trump and President Vladimir Putin of Russia.